Parts Of My Past: The Supplies Are Set! Before I started in on this Big Sort of 2019, I had to make sure that I had the right supplies on hand so I turned to my favorite card supply place in BCW Supplies to get what I needed. Here was what I got and what I am going to do with each. With these Shoe House with 6 Shoe Boxes . I am going to put all of my NY Giants hits by player. I have been wanting to do this for years and make it easier for me to search for cards. Especially if I decide to post some on here that may have never been viewed here. After buying one of these Shoe House with Boxes, I suggest checking out this instructional video on how to put one together. It can be pretty intenese otherwise lol. Well, at least for this uncoordinated blogger. If you want to see folding directions for the Shoe House, here’s the demo. Also needed this Card House that comes with 12 800ct boxes for my Griffey Collection. 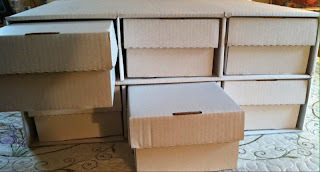 I am going to be putting them by year in these boxes and mark the years on the outside. They all will be penny sleeved and the ones with more value will be put in a safer spot. This is for general base and inserts. Had to grab the Penny Sleeves for my Griffey Jr project and for my binder swap out project of inserts for super star players. More details on that coming up. These Tall Card Dividers will fit perfectly in the bigger shoe boxes above to seperate my Giants players. I use index cards for my teams and players, but for something special like this project, it gets a major upgrade. 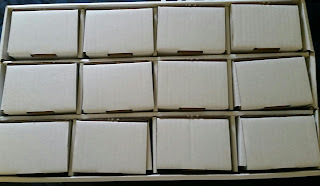 BCW also offers 3 versions of card dividers, for other sized boxes as well. I may need to look at some for my insert project. Once again, details on that is for another time. I suppose I got to end this article for today so I can get to tackling some of this project. But, I am curious what you guys use for your collection in terms of supplies? I've been trying to get my hands on one of those shoe houses for quite some time. My distributer never has them in stock and the prices online are ridiculous. Have fun with your sort! My ultimate goal is to have all of my cards in binders. I've never seen those dividers anywhere before. For my Red Sox I originally bought a set of dividers from a cards store that had years preprinted on little tabs at the top. They were really old and brittle and the tops all ended up breaking off. They seriously must have been from the 80s because they only went up to like 1986. Now I just use regular top loaders with a sticker at the top on which I hand write the year. Has anyone ever seen a protector for Rack-Pack's anywhere? I've got some amazing ones in my collection and I want to keep them safe.